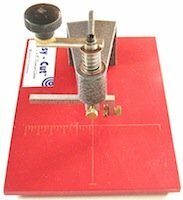 Glass circle cutters are the most accurate tool for circle cutting of fused glass. Glass circle cutters make the job easy and minimize the need to carry out any additional finishing work. Cutting tools come from a number of makers’ in a variety of styles and sizes. Prices can vary quite widely. Some of these cutters have a suction cup that allows the cutter to be attached to the glass. This type of set up allows the cutter, which is adjustable, to rotate around the cup. You should look for a cutter that will enable the glass to be scored in one motion. Some cutters have inbuilt cutting head whilst others use a normal glass cutter. There are a range of cutters from Silberschnitt, Inland and Glastar that have additional features that also allow you to cut strips and in some cases shapes. Silberschnitt also have separate suction cup cutters as well. Diameter of the cut may vary so you need to check the makers’ specifications. Fletcher produces a dual cutter that will also cut ovals, it will cut from 41/2" inches up to 21". The Easy Cut Lens Cutter will cut from 3/8 inch up to 5 inches. This compact cutter is very easy to operate. Ideal if you only have a need for small rounds in your glass fusing projects. A number of complete glass cutting systems may include a cutter or have one available as an option. Most of these cutters are not free standing and are usable only with their own particular cutting system. Delphi Glass have a nice range of Circle Cutters.